Catch Up: Everything You Need to Know About ‘Hellblazer’ Before The Wednesday Wedding! With 275 issues published since 1988, Hellblazer is not only Vertigo's longest-running series, but one of the longest running series currently being published by DC, period. Its only competition are books featuring Superman, Batman, and Wonder Woman. Every new writer tends to put their own stamp on the series, and two years into Peter Milligan's run on Hellblazer he's ringing in the anniversary with a special occasion: the marriage of John Constantine to Epiphany Greaves. After the jump, we've got everything you need to know to get onboard with this week's Hellblazer #275.Writer Peter Milligan has been banging out fascinating and creepy comics in England since the early '80s, and he landed here in the States with the original British Invasion. Shade the Changing Man was probably his biggest break, and his work on that title with Chris Bachalo led to work on Detective Comics. Over the next twenty years, Milligan consistently made waves in the comics industry, whether through books like Enigma with Duncan Fegredo or creating possibly the best X-book of all time in X-Statix with Mike Allred. When you want interesting, challenging comics, Milligan is a good choice, nine times out of ten. Interior artist Giuseppe Camuncoli, also known as "Cammo," has been kicking around the comics industry for around ten years now. He's worked on Hellblazer several times over the past ten years, including pitching in on Brian Azzarello's run on the title. You've seen his work in Wildstorm's The Intimates, a few X-books, Immortal Iron Fist, and perhaps most notably, Dark Wolverine with Marjorie Liu and Daniel Way. At some point over the past few years, Cammo's art went from "good" to "great," and he's bringing the heat on Hellblazer, whether he's doing full pencils or providing layouts for Stefano Landini. Cover and occasional interior artist Simon Bisley makes ugly look good. He helped make Lobo into a character people actually enjoy, and that's just a small portion of his body of work. He's done album covers for Danzig, comics for everything from Batman to the Teenage Mutant Ninja Turtles, and even a book full of paintings and sketches of events from the Bible. When you want something to look grimy, dirty, and ugly, but still aesthetically pleasing, Bisley is the guy to go to. 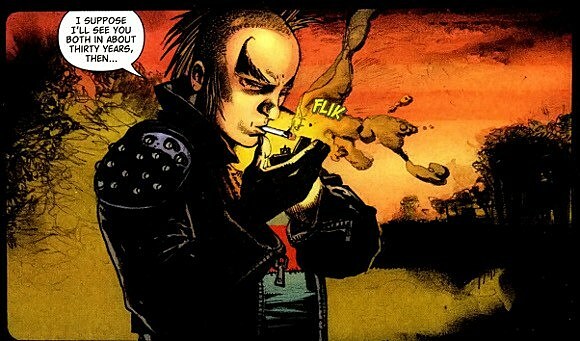 He has done a couple of short stories and flashback-related pieces in Hellblazer, and all of them rule. As far as the cast goes, things don't go well for anyone John Constantine calls a friend, and Phoebe Clifton-Avery found that out the hard way. She was a successful doctor and he was a screwed-up magician from Liverpool. Somehow, some way, the two hooked up and fell in love. 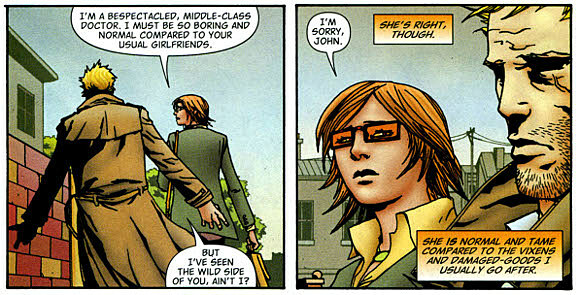 They had a disgustingly sweet relationship, but happiness isn't a good thing in Hellblazer. It's a sign that things are about to go down. And go down they did--after one of Constantine's spells ended up intruding on her life, and he lies to her about it, she leaves him. He tries to get her back with a love potion, a plan that she sees coming and sidesteps, before she's killed by an ancient Babylonian demon. John tries to bring her back to life, but his soul is too impure to make it happen. Epiphany Greaves is Constantine's future wife and the daughter of Terry Greaves, noted London gangster. 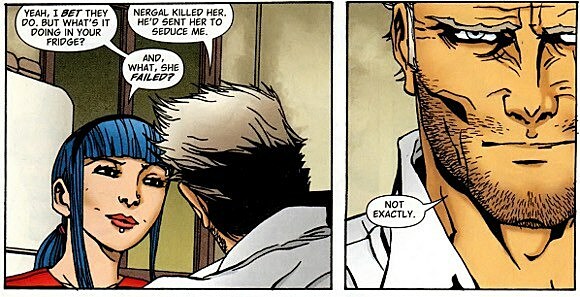 This blue-haired young woman had a crush on Constantine since she was 15. Her father, of course, made it clear that anyone interfering with his baby was completely off the table, so she pined in silence. Now that she's an adult and an accomplished alchemist, her crush is back. She whipped up the love potion for Constantine, and after Phoebe died she created a resurrection potion, but Constantine's luck kicked in and Epiphany was left in a coma. She soon woke up, and after Constantine jetted to India to resurrect Phoebe, she followed him. Somehow, some way, she managed to work her way under his skin and into his heart, against his increasingly hollow protests. Now, she's ready to do the unthinkable: turn John Constantine into an honest man. Standing in the way, at least briefly, is Terry Greaves, Epiphany's father. As far as angry fathers go, Terry is high up there. He's had Constantine beaten on a few different occasions, not to mention coming within inches of killing Contantine outright for putting his daughter into a coma. All of this, plus his history as a ruthless gangster, makes for a father-in-law from anyone's deepest darkest nightmares. He loves his little girl, has trouble seeing her as an adult, and sees red whenever he can't get his way. The combination of an irate Epiphany and a smooth-talking Constantine eventually won him over, at least nominally. Nergal and Constantine first met when Constantine summoned him to kill another demon back in the '70s. Of course, summoning demons is an ugly game, and Constantine, still relatively new to magic, screwed it up. The other demon was killed, but in exchange, a little girl was dragged to hell and Constantine was driven insane. Later, circumstances forced a blood transfusion between Nergal and Constantine, which had the convenient side effect of slowing Constantine's aging. Nergal has been a regular thorn in Constantine's side, playing a part in having his sister Cheryl sentenced to Hell and possessing Chas Chandler on not just one, but two separate occasions. Kit Ryan is the one that got away. She dated and loved Constantine in the '90s, but she left him and returned to Belfast when things got dangerous. 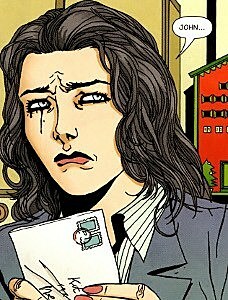 This wise choice makes her a member of the relatively low number of living friends, or lapsed friends, of John Constantine. Kit doesn't take crap off anyone, particularly not Constantine, and she's pulled his fat out of the fire more than once. 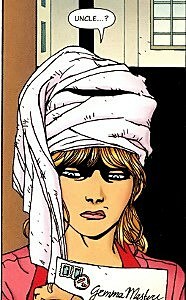 It will be interesting to see what her reaction to the marriage is, since she knows all too well what it means to be involved with John Constantine. If you want to talk about long-suffering friends, Chas Chandler is the ultimate example. He's been beaten, possessed more than once, blown up, nearly killed in several different ways, and even had his family almost murdered, and it all happened on John's watch. Despite that, Chas stands by his buddy, much to his wife's chagrin. Constantine was never much of a fighter, since doing magic doesn't build muscle mass, so Chas was always there to throw a punch on his friend's behalf. All that death-defying action and inexplicable loyalty has paid off, however, since Constantine wants Chas to be his best man at a wedding that will almost definitely be crashed by every single demon on Earth. C'est la vie, right? Don't let her last name fool you--Gemma Masters is a Constantine, through and through. She's John's niece and an accomplished magician in her own right. Her life doesn't attract the nigh-constant horror and carnage that Constantine's does, but she's still managed to run up against vampiric children, ghosts, serial killers, demons, and a battle that was almost the end of the world. She likes to try to play on the same level as her uncle, but he's never believed that she was ready for the big leagues, no matter how much she wishes otherwise. John Constantine is a man who gets by and lives his life by any means necessary. His magic hasn't given him a life of leisure or fame. In fact, he's undoubtedly screwed over most of the magicians in London, and pissed off magicians, demons, angels, politicians, and police officers on every continent and in every plane of existence. 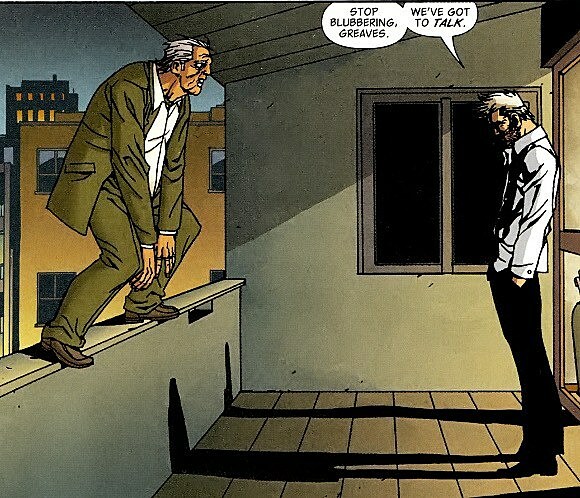 If you happen to mention to a new acquaintance that you're good friends with old John Constantine, you're as likely to be punched in the face and tortured in Hell for all eternity as met with a blank look. Love him or hate him, and the answer is probably "hate him," Constantine is a charmer who can fast-talk his way out of almost any situation. Any situation, that is, except love. He's hooked on Epiphany, and you haven't seen Constantine until you've seen him get jealous over a girl.